Thank you to Visit Bemidji for hosting us in the area. 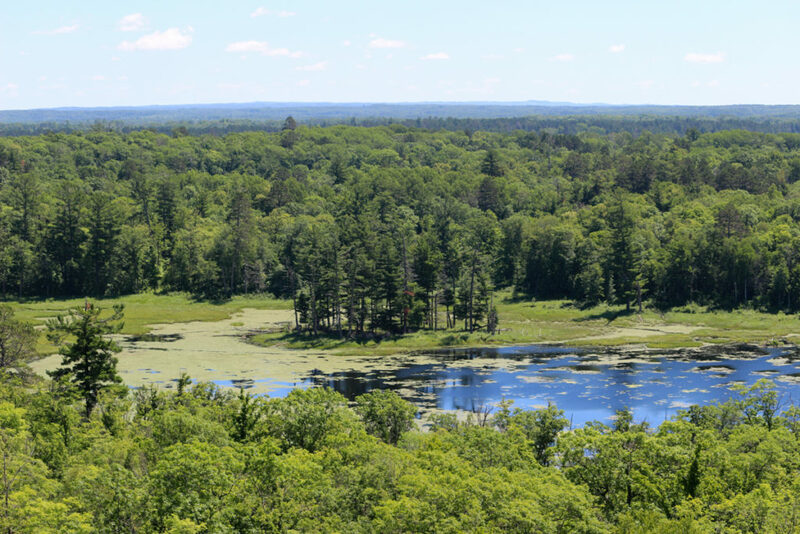 The 32,000 acre Itasca State Park, located near Bemidji, Minnesota, includes more than 100 lakes. But the lake that we went to see is Lake Itasca, because Lake Itasca is where the Mississippi River begins. 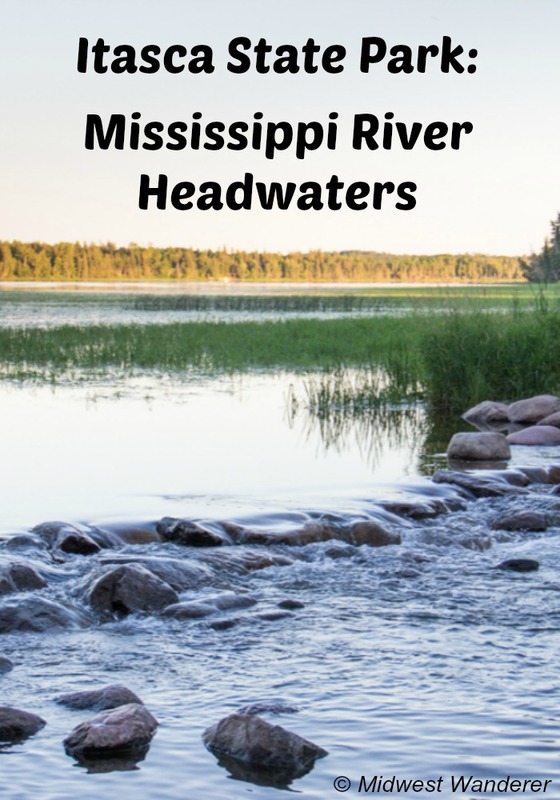 Walking through the Mississippi River headwaters had been on my bucket list for a long time. Now was the time for me to check that one off my list. It’s called the Mighty Mississippi or Big Muddy, but at the headwaters, the Mississippi River is neither mighty nor muddy. It’s more like a stream as it begins its journey 2,552 miles down to the Gulf of Mexico. The area around the headwaters is serene in late evening, but on a hot summer day it’s buzzing with tourists and locals wanting to cool off in the water. And I joined them. The start of the Mississippi River is shallow enough that you can actually walk across. The deepest part of the Mississippi river, about 200 feet, is somewhere in Tennessee. But here at the headwaters it’s a popular spot for wading. It’s amazing how narrow it is, also, especially since we’re used to seeing the Mississippi River from Illinois, where it’s really wide and the “Mighty Mississippi” reference is appropriate. Here it’s only about 25 feet wide, and other parts within a few miles of the headwaters are even narrower. It’s also amazing how clear the water is at the headwaters. The Mississippi River headwaters are separated from Lake Itasca by big rocks. In fact, you can cross over on the rocks, and as long as you don’t slip off of them, you can cross the headwaters without getting wet. Fun Note: Legend has it that if you cross the river at its headwaters, you will lead a long and prosperous life. 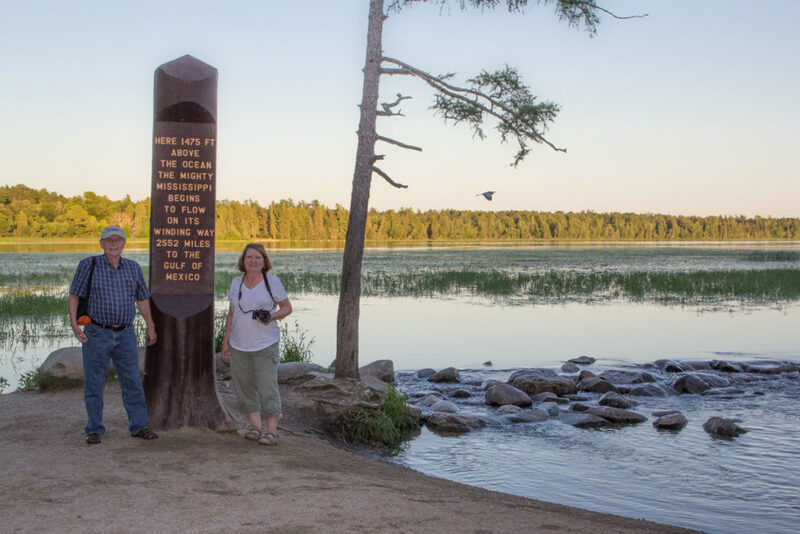 Besides playing in the headwaters, there’s plenty more to do at Itasca State Park. 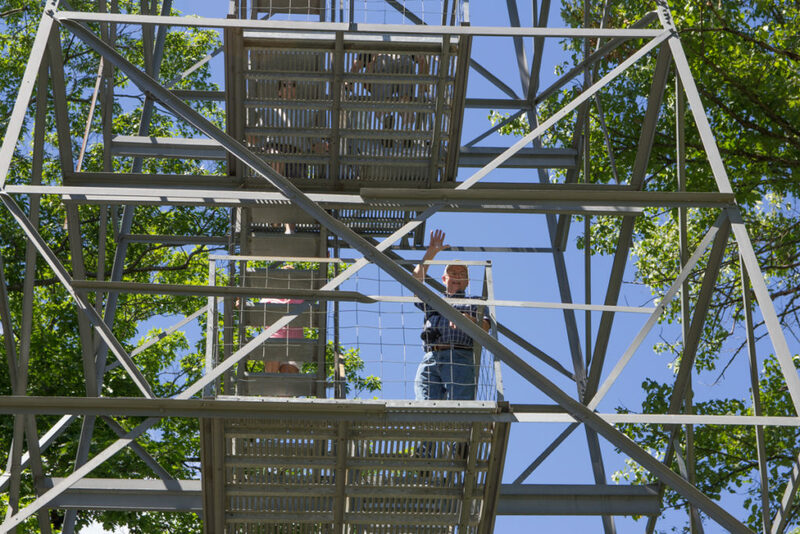 We hiked a little bit, including to the 100-foot tall Alton Fire Tower. Skip says the views from the top of the tower are spectacular. I didn’t make it all the way up. My fear of heights got the better of me, and I went back down. Another place to visit is the Jacob V. Brower Visitor Center. This is where you can get information about the park, so you might actually want to make that your first stop. There are exhibits in the visitor center, too, including some hands-on activities. Itasca State Park is open year-round, but parts of it are seasonal. For full details, visit the park website. During our visit to the area we stayed at the Country Inn & Suites by Radisson in Bemidji, Minnesota. The hotel is on the shore of Lake Bemidji. Check rates and reviews on TripAdvisor. Crossing there is on my bucket list, too! Thanks for sharing. Thank YOU, Jessica. It was more fun than I even thought it would be.